For some, the simplistic design just doesn’t cut it anymore. They can get a bit cumbersome if you have to wield the wand with both hands and even squeeze in some combing in the middle. With today’s hectic and fast-paced lifestyles, doing all of these regularly can be too time-consuming. With today’s technology, though, it’s easy to expect to find new tweaks that will make hairstyling a lot simpler at home. The InStyler Max is a great example of this as this product is not just a hair straightener, but is an effective curling iron as well. InStyler Max – Now Available at a Great Price on Amazon! First thing’s first, though, you need to know that the InStyler Max doesn’t look like your run of the mill flat iron. While it does straighten your hair, it looks more like a curling iron that’s been attached to a hair brush. It looks nothing like your hair straightening tool, except for its tongs-like design, and it promises to do a better job. The key to the Max InStyler’s success and effectiveness is its rotating barrel. This is the part that heats up and its movement is designed to apply the heat to your strands effectively and evenly. The brush that’s attached to the unit helps smoothen and polish your strands, giving you smooth and shiny locks as a result. This tool’s design also allows it to be highly versatile. While it’s not exactly a flat iron, it can still iron out your locks by clamping it in between the barrel and the brush. You just need to run it down the length of your locks and you can already enjoy pin straight and frizz-free hair without a fuss. Curling your locks is also very easy to do with the Instyler Max. By wrapping your locks around the barrel and clamping it down with the brush, you can already enjoy some nice curls or waves depending on the size of the barrel your unit has. This InStyler curler is also known as the Instyler Max 2 way rotating iron, you can easily switch up your look by changing the direction of the barrel’s rotation. This will help you create face-framing curls or natural looking ones with just a double clamp so you don’t have to worry about how you need to wrap your hair to create the results you want. 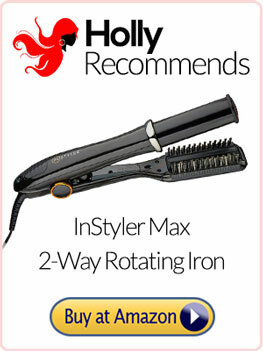 As the InStyler Max rotating iron looks different from other styling tools, it might be a bit trickier to use at first. This is especially true if you haven’t gotten the hang of using a flat iron just yet. The barrel and brush design can be a bit intimidating, but don’t fret. It’s actually quite easy to use, you just need to get your hair in between the barrel and brush and you’re good to go. Leave it as is to straighten, and wrap it around the barrel to curl. 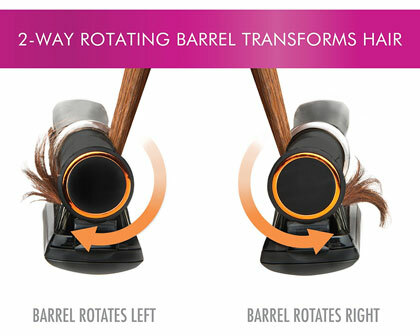 Replacing the plates on flat irons in the InStyler Max is the heated rotating barrel. Its design makes it capable of distributing heat evenly on your hair, allowing it to style your locks. It can also run clockwise or counterclockwise to easily create face-framing curls or natural waves. To ensure the good health of your locks, this tool also has the ionic technology packed in the bristles of its brush. This feature helps seal in moisture which helps protect your locks from heat damage and make it look smoother and shinier. Ensuring the proper distribution of heat, the barrel of this Instyler hair straightener and curling iron is made with tourmaline infused ceramic. This also makes it ideal for all hair types. Too much heat can definitely damage your hair, so this product comes with four heat levels so you can choose the right temperature to work with your locks. Wielding a flat iron sometimes require both of your hands, especially if you have thick, coarse, and unruly hair. While the InStyler Max is very easy to use, you might still need to guide the tip with your other hand when straightening your locks. The cool tip will help protect your fingers while you do so. Cut down your styling time further with the quick heat up feature of this product. If you always forget to unplug your styling tools, you don’t have to worry too much about it. Further boosting its maneuverability is its lengthy swivel cord. No more tugging and contorting to reach the top of your head with the InStyler Max. The Instyler ionic styler may seem like a great product based on its features, but it might still have a few things that can put you off. So learn more about them below. You can create a lot of looks with just one tool. It won’t damage your hair. It’s ideal for all hair types. The barrel is available in different sizes, so you can choose one that will suit your needs. You’ll get smooth and shiny hair, as a result, thanks to its components and special design. 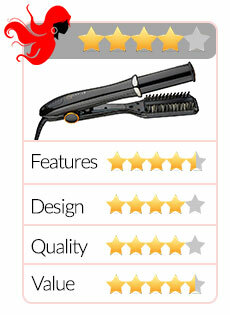 You can find lots of InStyler reviews that will tell you a few tricks in using this tool. It has plastic parts that can break over time. It has a slight learning curve but you’ll surely get the hang of its use after a few uses. 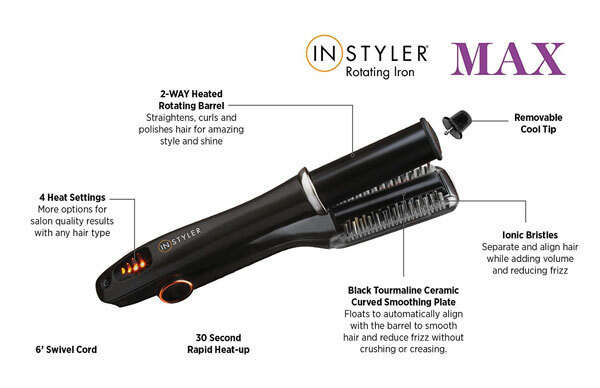 Innovative, efficient, and versatile, the InStyler Max is a styling tool that offers great value for your money. 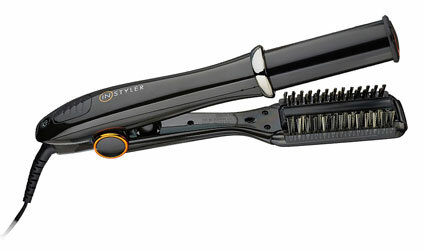 It’s basically a few heat styling tools in one nifty package, making styling and storage more convenient for you. This InStyler curling iron can be the only styling tool you need at home, making it a practical option for those who are in the market for a good flat iron that can also serve as a curling wand. Click Here for Big Savings on the InStyler Max at Amazon!